With a bigger case size than the Aquanaut ref. 5167 and a much thicker case profile, the new Aquanaut Chronograph ref. 5968 is 'beefier' in a good way. Featuring a 60-minute flyback chronograph the counter at 6 o'clock adopts the characteristic contours of the gently rounded octagonal bezel. The elongated pushers are harmoniously integrated on both sides of the crown protector. The chronograph displays —chronograph hand, the peripheral railway track scale with quarter-second divisions and the 60-minute counter— are bright orange and contrast well against the black dial with the typical Aquanaut embossed pattern. Perhaps the biggest downside to this new watch is the fact that the date needs to be set using a corrector on the caseband instead of using the winding crown. Thanks to its screw-down crown and screwed-in case back the watch is water resistant to 120 meters. It exhibits a refined alternation of delicately satin-finished surfaces and flanks, producing the same interplay of light as the bezel with its smooth glossy surfaces and polished chamfers. legibility, applied Arabic numerals in white gold and the broad baton hands, all with luminous coatings. While the dial features bright contrasting orange accents, these are not offensive and play well with the overall design of the watch, at the end of the day this is still a Patek Philippe in essence and DNA. The new Patek Philippe Aquanaut Chronograph ref. 5968A is powered by the automatic calibre CH 28-520 C with flyback chronograph. This movement is composed of 308 parts and 32 jewels. 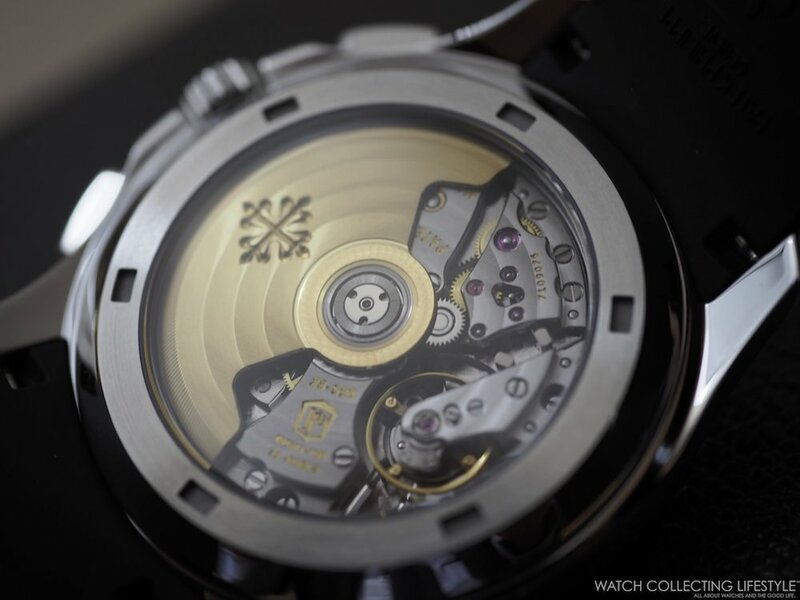 The movement beats at a frequency of 28,800 vph and provides a power reserve of 55 hours when fully wound. This is the very same movement powering the Nautilus Chronograph ref. 5980. On the wrist, the new Patek Philippe Aquanaut Chronograph ref. 5968A wears true to its size and quite comfortably. To be honest, the watch doesn't wear that much bigger than the Aquanaut ref. 5167 which is 2.2 mm smaller and at least half thinner. A very sporty Patek that takes the center stage at Baselworld 2018. Now, as far as the price, the new Aquanaut Chrono is far beyond the price of the Aquanaut ref. 5168 in 18K white gold. And for that kind of money, it is OK to sacrifice precious metal for this ultra sporty new stainless steel piece. Sticker Price $43,774 USD. For more info on Patek Philippe click here.